Food is a big part of most people’s travel experiences. It is for many, one of the best ways to experience the local culture. Local food, which often can be street food, tends to approached cautiously. One question that often lingers is “is the food safe? Or the other variation, “will I get sick if I eat the street food? Eating local and safely on the street for some might seem rather risky. And while there is no guarantee against getting sick, street food and local food can be safe to eat. On our quest for authentic food, we’ve had numerous meals on the streets. From street carts in Bangkok, to the markets of Cambodia, we’ve pushed ourselves go beyond our comfort zones. From eating fresh ceviche from the back of a truck in Peru, to choripan grilling on the streets of Argentina, we’ve been delighted by the street eats we’ve found. After over 4+ years of traveling through 14 countries and 70+ cities on the hunt for the authentic foods, we’ve been fortunate not to have had any serious stomach issues. 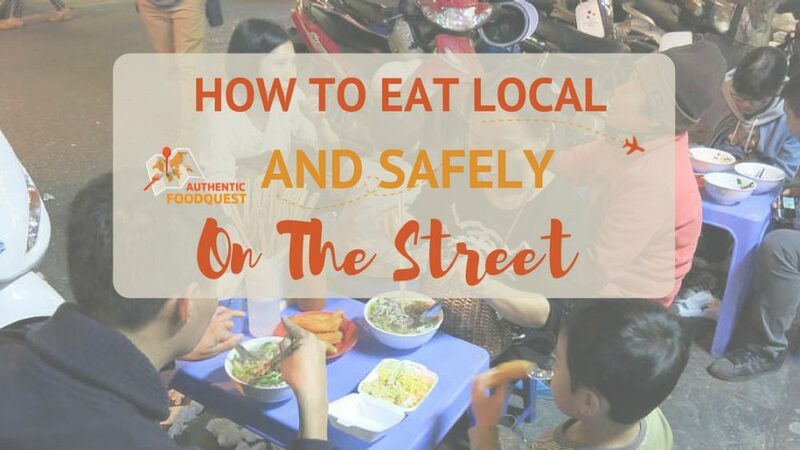 Following are our tips and guidelines for how you can eat local and safely on the street. 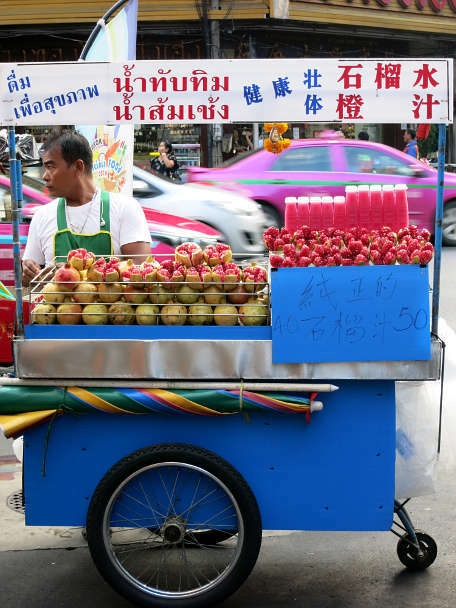 Food from sidewalk vendors, colorful markets and push carts is one of the best ways to “taste” the local culture. Whether we are traveling in small towns, or cities with a reputation for fine dining, eating on the street is an experience we always look forward to. From Bangkok, Hanoi, Buenos Aires to the U.S., we eat street food as often as we can. 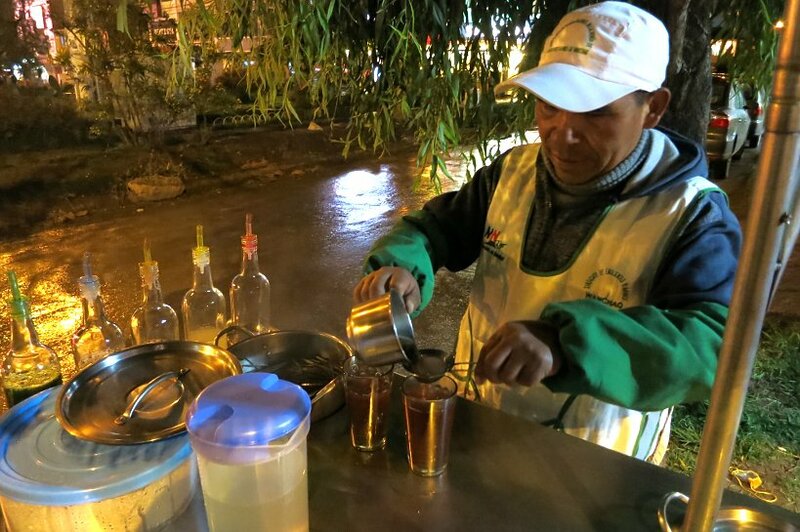 Street food, a concept with many definitions, is inclusive of a wide range of foods and beverages sold and sometimes prepared in public places, most notably on the streets. Street food is not only delicious, it’s often cheap, too. Experiencing a city through street food is a great way to explore the area. Popular in Asia, massive in America, and growing in Europe’s, here’s how to be best navigate the street eats on your travels. In our free ebook the best 5 ways to find authentic and local food on your travels, we recommend eating at the farmers market! This does take an adjustment because often times the hygiene standards in some countries might not be the same as what you are used at home. 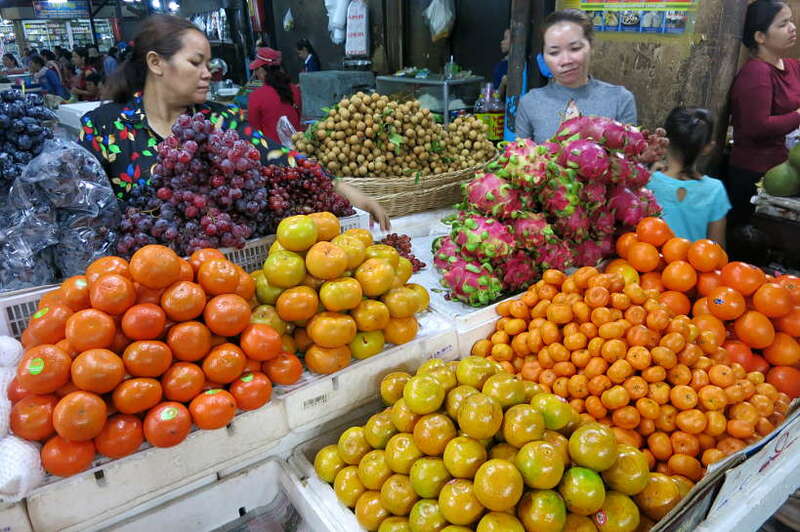 If you’re curious about some local fruits, ask the vendor about it. More likely the vendor will cut up a sample for you to try. Choose the fruits that need to be peeled and avoid any samples that have been sitting out. The same principle applies when it comes to trying local foods at the market. Go when the market is busy and let the delicious smells of hot food tempt you. However be cautious about what you order. If you stick with hot food you’ll have a better chance of staying safe. When looking for a place to eat, make sure it’s popular with the locals. Check the lines. Are there a lot of people waiting to be served? Is there a high turnover of dishes? Even better, are there any elderly people and children eating there? If so, this is often an indication of food safety. No mother will feed her child unsanitary food. And grandma and grandpa, have been around the block, you can trust them to know what is good. With street food, unlike restaurants, the kitchen is right in front of you. This is the perfect moment to check out the hygiene levels of the food cart. How is the food being prepared? How is it being cooked? Does the oil look golden fresh or is it old and dark? Do the cooking utensils look clean? If anything looks suspicious, don’t take the risk. Move on to the next vendor or cart! With market or street food vendors, try and avoid the ones where the person handling the money is the same person cooking the food. In South America for example, we ate at food stalls where there was a dedicated person cooking the meals and another person handling the money. If this is not the case, watch and make sure that the person is cleaning their hands in between cooking the food and handling the money. 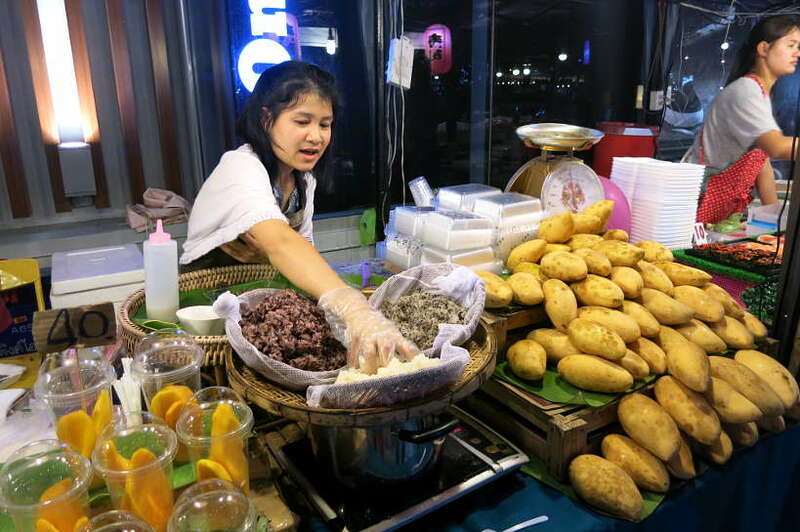 In Thailand, many vendors who would wear gloves to handle the food and then remove them to receive payment. Remember, germs get transmitted by dirty bills and coins. If you’re in doubt, keep walking. Utensils and glasses is another area to carefully watch for the spread of germs. Make sure to wipe utensils and glasses before using them. If you can, carry your own personal utensils with you. We personally always have our Sporks with us. These spoon/fork combos have come in handy when trying something at the market. They’ve also been a lifesaver when the utensils don’t look clean. In Vietnam, we noticed that some local food joints would reuse the water glasses without washing them. If you are going to use the cups, make sure you use the straws that are available. Otherwise, carry your own water bottle or buy a bottle of water instead. Washing your hand before eating might be second nature to you. And if it is not, we strongly encourage it. But what do you do when there are no bathrooms around? The best solution is to keep hand sanitizer with you at all times. With a couple drops of gel you can easily clean your hands on the go. And, with the lack of napkins in most of the countries, hand sanitizer serves a second purpose. Their use replaces napkins when needed. Don’t neglect this easy to carry and handy item for the road. Ever since we discovered hand sanitizer, we cannot travel without it and these pills are an essential part of our packing list. Activated charcoal is a natural treatment and used around the world as an antidote for hundreds of poisons. It works by absorbing poisons and toxins in the digestive tract, by binding them together thereby reducing their potency. There is a story that is told about activated charcoal. “In 1813, French chemist Michel Bertrand swallowed five grams of arsenic trioxide: 150 times the lethal dose. He had mixed it with activated carbon beforehand. He experienced no nausea, no vomiting, no diarrhea, no excruciating cramping, no severe burning in the mouth or throat, no collapse, and no death. In a dangerous but dramatic way, he had avoided certain death while publicly demonstrating charcoal’s phenomenal ability to neutralize poisons”. We carry activated charcoal pills and use them preventatively before meals. Sometimes, if something is not feeling right after eating, taking two pills afterwards helps calm the stomach. 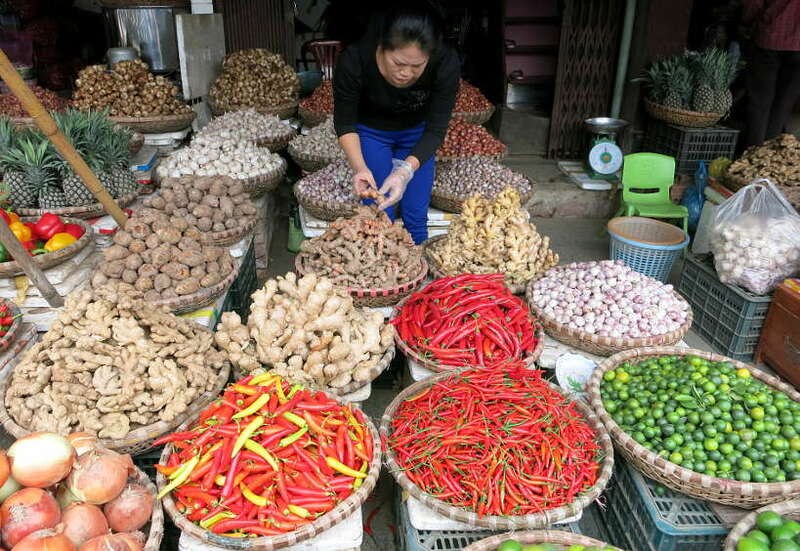 In Southeast Asia, the abundant use of spices and herbs are prominent and used to give food rich flavors and taste. Many of the spices and herbs used are traditionally known to relieve common ailments and promote generate health. Garlic, is a typical ingredient in Southeast Asian cooking and its intense flavors and aromas are essential to adding depth to the overall taste of dishes. A member of the onion family, garlic is used in making the base of many delicious curries. Garlic, also called “the stinking rose” has many health benefits. When it comes to stomach, garlic clears up most intestinal problems like diarrhea and more. It works by destroying the harmful bacteria present in the intestines. On your travels, particularly to spice-loving countries, load up on the spices and enjoy all the local flavors. Having clean water for your travels is paramount. Not all cities and towns have potable water. To be safe, it’s better to be prepared with your own water purifier and filtration system. We use GRAYL water bottles, for purifying and filtering water. In less than one minute you can filter any water deemed non-potable. The bottles have a slick design, are lightweight and the filters are changed infrequently about every 2 to 3 months. No matter how you choose to drink safely on your travels, be sure to carry your own water purifier and filtration system to stay safe. With no additional plastic water bottles to buy, you’ll also be doing good for the environment. While access to safe water can be an issue while traveling, you also want to be cautious about contamination in juices and iced drinks. It goes without saying that when the water is not potable, the ice needs to be avoided. However, on our travels we’ve been pleasantly surprised to see ice being distributed widely in cities. 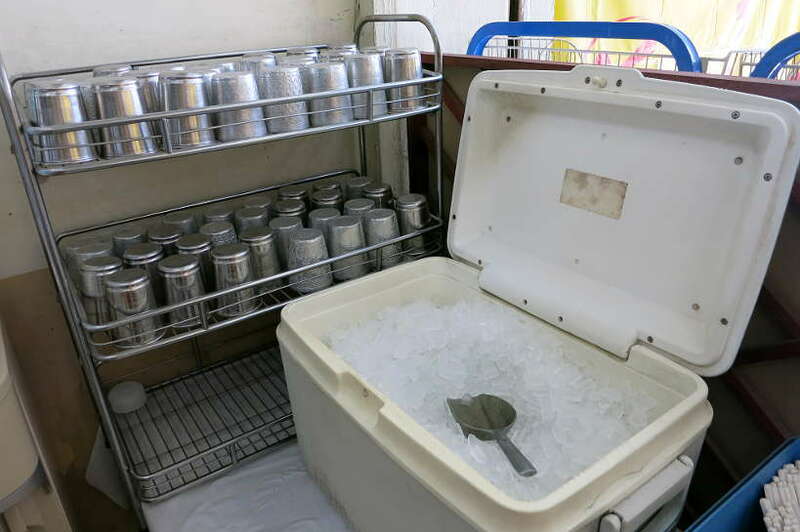 In Thailand, Cambodia and Vietnam for example, in the mornings, we would see ice trucks delivering huge blocks of ice to restaurants and local vendors. Even though you may have to pay extra for it, it’s worth the peace of mind knowing the ice is safe. 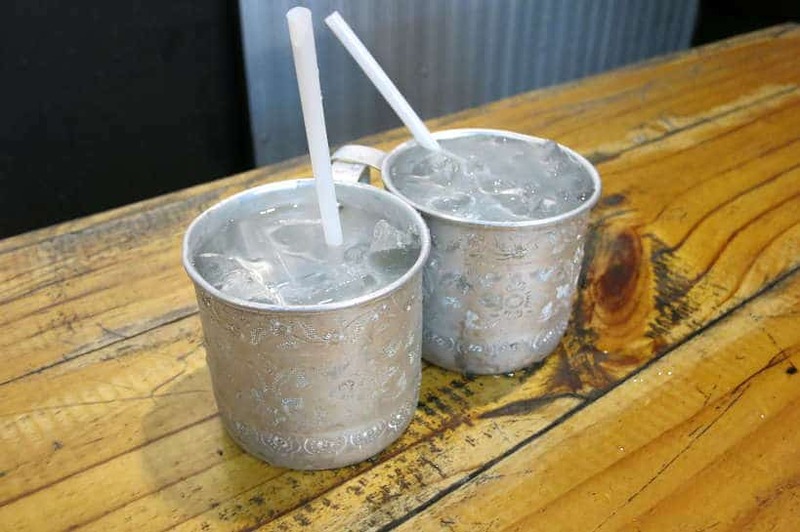 However, if you are in smaller towns or in doubt, avoid the ice and iced drinks. No matter how much precaution you take, sometimes, you may just simply fall sick. If that happens, the most important thing to do is to stay calm. When traveling and away from your familiar comforts, getting sick can be scary. If you are in a country where you don’t speak the same language, not getting understood can be challenging. Regardless of the context, stay calm and remember, there are other people living there who’ve probably had the same issues. There are doctors and hospitals with qualified staff, and they will take care of you. Learn to trust and don’t let fear make the issue worse. As mentioned previously, activated charcoal really helps with stomach bugs and stomach flu. Even if you have already eaten a meal and your stomach starts flip-flopping several hours later, you can still take the activated charcoal pills. Even if you end up throwing up, you’ll feel better faster. On several occasions, while traveling and exploring the local flavors, our stomachs would sometimes start feeling queasy. Before going to bed, would we pop some activated charcoal pills and wake up the next morning feeling as good as new. From personal experience, activated charcoal has really worked wonders for us. It is something we recommend highly for any travel or first aid kit. One of the benefits of connecting with locals on your travels, is getting local insights on what to do in town. In addition, locals are great resource for what to do when you are not feeling well. You can count on them to guide you to the necessary medication and local remedies and the best doctors if necessary. In Peru, after eating at a local Cusco market, Rosemary started feeling slightly unwell and a little nauseous. After talking to our local host. She recommended trying “emoliente”, a local natural remedy sold by vendors on little street carts. This magical drink made with natural plants from the Andes mountain cured the symptoms. The next day, after the glass of emoliente, Rosemary’s stomach was better and we were ready to continue our exploration of local flavors. While in Southeast Asia, we discovered the healing power of ginger. This traditional food originated in China and is said to be one of the oldest medicinal foods. Ginger is often taken for calming an upset stomach and to treat nausea and motion sickness. Beyond healing the stomach, taking ginger has many more benefits, including cancer, cholesterol and weight-loss. For more about the wonders of ginger, read more in this detailed article. Ginger tea, ginger candy and ginger flavored food items are abundant in Southeast Asia. Even when we were 100% healthy and feeling great, we would drink ginger tea or snack on ginger treats. 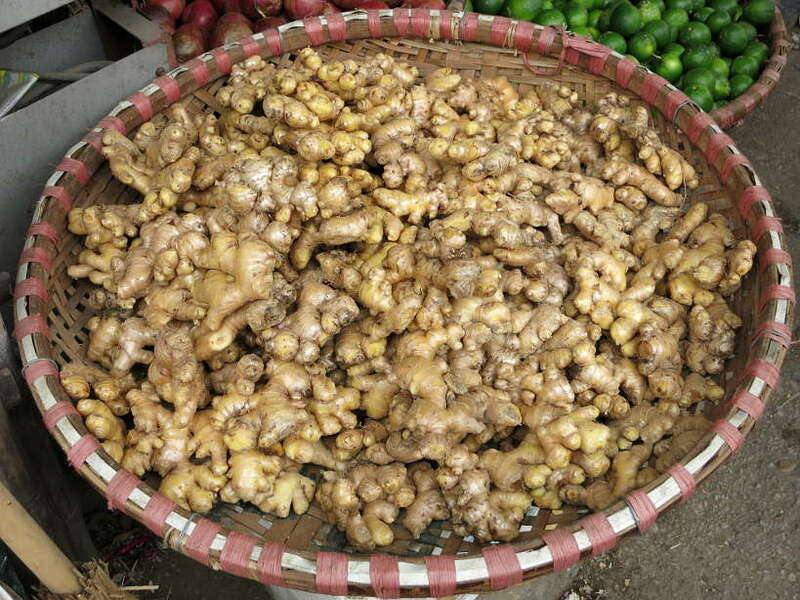 With its widespread availability, taking ginger is an easy way to eat safely in Southeast Asia. Travel insurance is something most travelers consider when traveling. But what about dental insurance? Unexpectedly, while in Argentina, Rosemary’s tooth chipped. She was not eating and was actually working in the room, when all of a sudden she felt something strange on her tongue. A brief look in the mirror revealed a broken tooth. You can read more about the story in the article we published why you need travel insurance for your food adventures. In case of emergencies or unexpected events, be sure to have travel insurance. 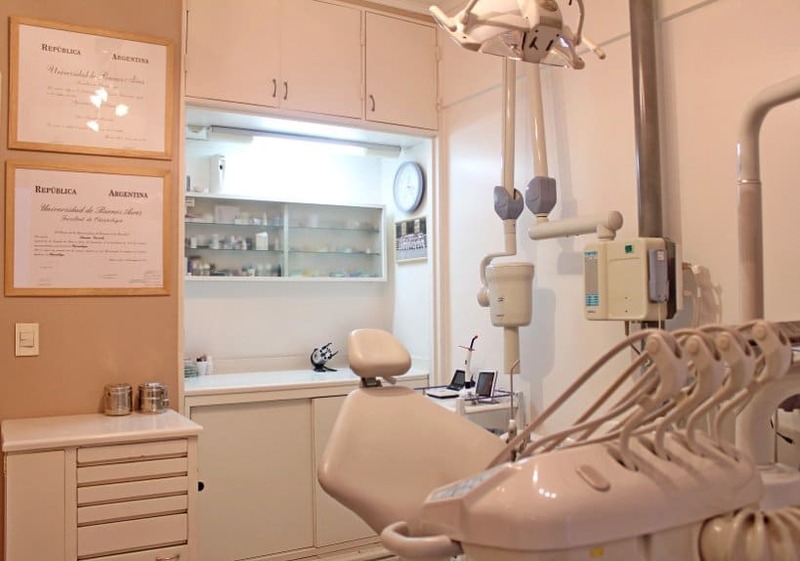 We use World Nomads Insurance, which also covers dentists visits. No matter the length of your trip, be prepared for unforeseen circumstances by traveling with World Nomads insurance. This is more a preventative tip. Depending on where you are traveling to and the length of time you will be away, food travelers should consider getting vaccinated. The CDC (Centers for Disease Control and Prevention) offers an extensive list of resources that you can find here. In our case, for our trip to South America, we got Typhoid and Hepatitis A shots. The Typhoid shot covers us for three years. Before leaving for Southeast Asia, we got a second shot of Hepatitis A, which now has us covered for the next 10 years. Beyond that, we were already up to date with DPT and Hepatitis B vaccination shots. Please do consult with your doctor or medical professionals before your travels. 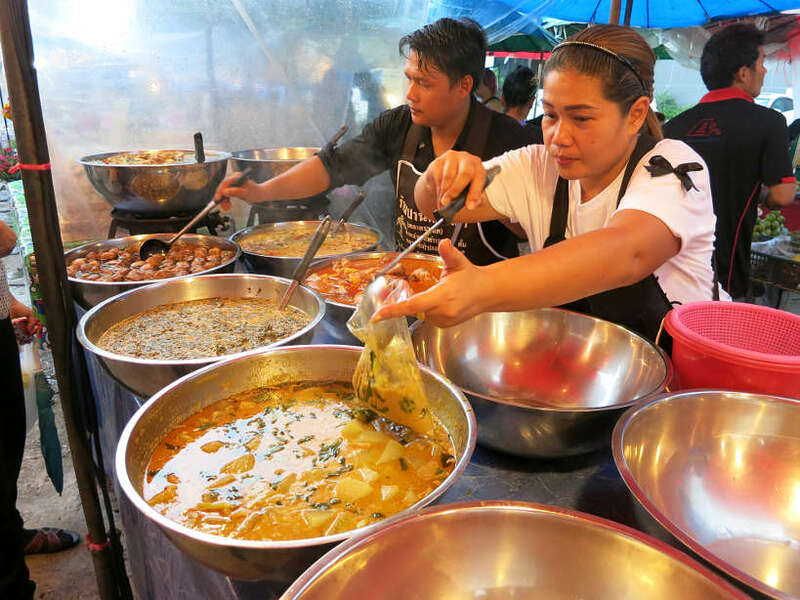 Bangkok is one of the most exciting cities for street food. There are not many places in the world that offer an incredible variety of spicy, savory, and sweet treats cooked street side. As exciting as it is, it can also be intimidating. With so many options it’s hard to know where to start. After spending 6 months in Southeast Asia, including Bangkok, we created Authentic Food Quest Food Trails to help you eat safely in Bangkok. In the food trail, you’ll find an overview of the local and authentic dishes, desserts and drinks not to miss on your travels. You’ll also find a downloadable map with the exact location addresses and hours of operations to make planning easier. 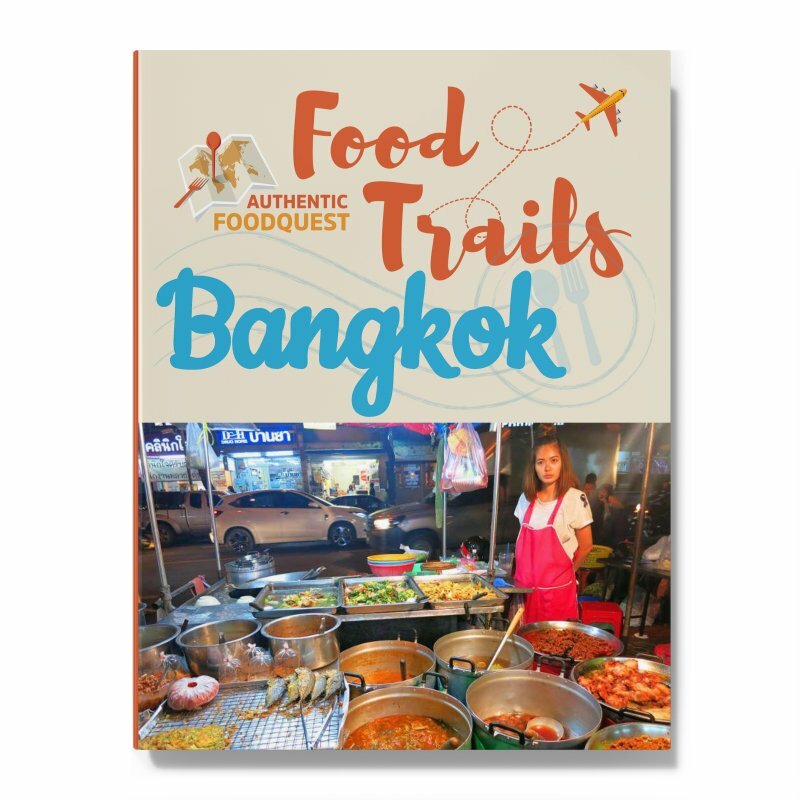 To get a copy of your Bangkok food trail, simply click this link – Bangkok Food Trail to download your copy today. Vietnam is one of the cheapest and most delicious places to eat street food. In fact, most of the dining is done on the streets on short little stools. Hanoi, Vietnam’s cultural center and birthplace of some of the country’s most iconic foods, is a culinary haven worth exploring. 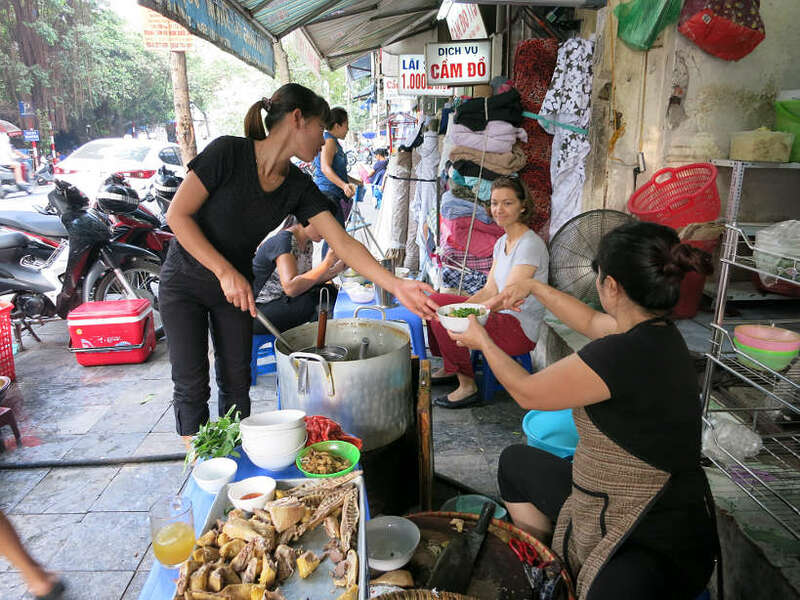 We created a food trail to help you navigate the street food scene in Hanoi. Using pictures and clear directions, we make it easy for you to discover the food and the places to go. You’ll take delicious detours that are worth the extra mile, with no fear of missing out. Discover where to eat and what to order. With this self-guided food trail, you are in charge. You get to create your own local experience. 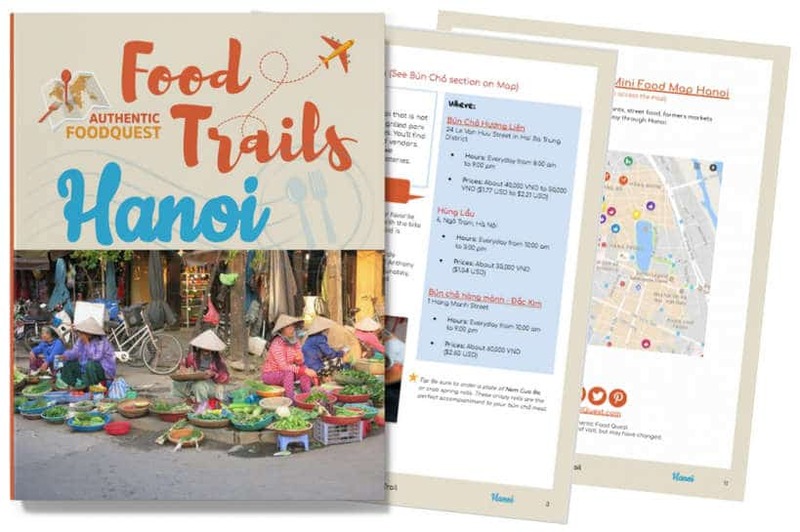 To get a copy of your Hanoi food trail, simply click this link – Hanoi Food Trail to download your copy today. If your travels take you to Buenos Aires, or Singapore, download your food trails and enjoy the flavorsome and local cuisine. 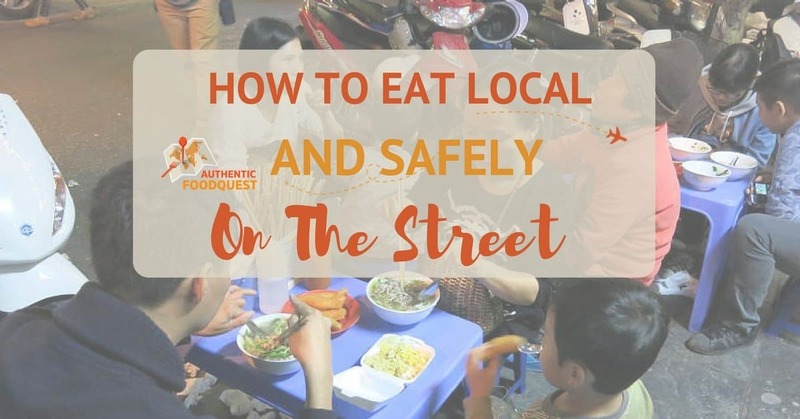 Now that you read our tips on how to eat local and safely on the street, are you ready to experience the local flavors on your travels? At Authentic Food Quest, we strongly believe that traveling through local food is the best way to get to know a culture and connect with the locals. Without eating the local food on one’s travels, you would be missing out on a unique perspective of the destination. Armed with these tips, we are confident that you will be able to eat local and safely on the street. Safe travels and explore local flavors! What are your tips to eat local and safely on the street? Share your comments below. Disclosure: please note that some of the links might be affiliate links. If you click through and make a purchase, we may receive a small commission (at no additional cost to you). Thank you in advance for your support! This post is so helpful! It’s good to know how to safely eat street food. I got sick once in Hong Kong from street food and that was the worst experience ever! Thanks for sharing about your experience in Hong Kong. That’s really too bad. It’s no fun getting sick whether at home or while traveling. Hope you picked up a few new tips for your next travel adventure. Thanks for stopping by. Awesome tips! They’re common sense, but I didn’t think of some of them until you pointed it out – like whether there are elderly and children eating there. I want to make a suggestion that you also carry a metal straw along with sporks? That way you can also avoid using plastic straws. They’re really handy, and the large bore ones are super easy to rinse clean. Thanks Nuraini, so glad you enjoyed the article especially the tip about children and elderly. 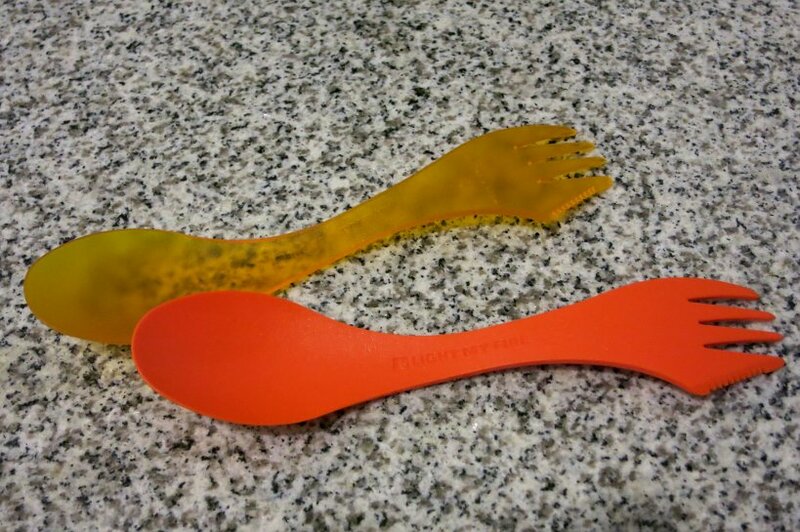 Great idea about adding a metal straw along with the sporks. Definitively something to add to the traveling food kit. Thanks for sharing your tips!! These are some REALLY awesome tips! I wouldn’t have thought to carry my own utensils, and the ones you have are cute!! It really is important to keep a watchful eye on the vendors, and even a good reminder now and again if you easily get distracted by the delicious looking food! Thank you so much, Miranda, and thrilled to hear you love the tips. To eat local and safely on the street, one really must pay attention to lots of things and try not to get distracted by the food 🙂 Do get yourself a handy spork…you feel and eat much safer! Appreciate you stopping by! I love eating street food everywhere I go but I always follow your first rule: to be hot and cooked in front of me. I was lucky to only get sick once, and that wasn’t even because of the street food but some train meals in India. Hand sanitizer before starting your meal is a must as well. That is indeed the beauty of street food, it’s cooked right in front you giving you clear view of the kitchen and the vendor’s habits. Getting sick can happen anywhere, not only on the streets. 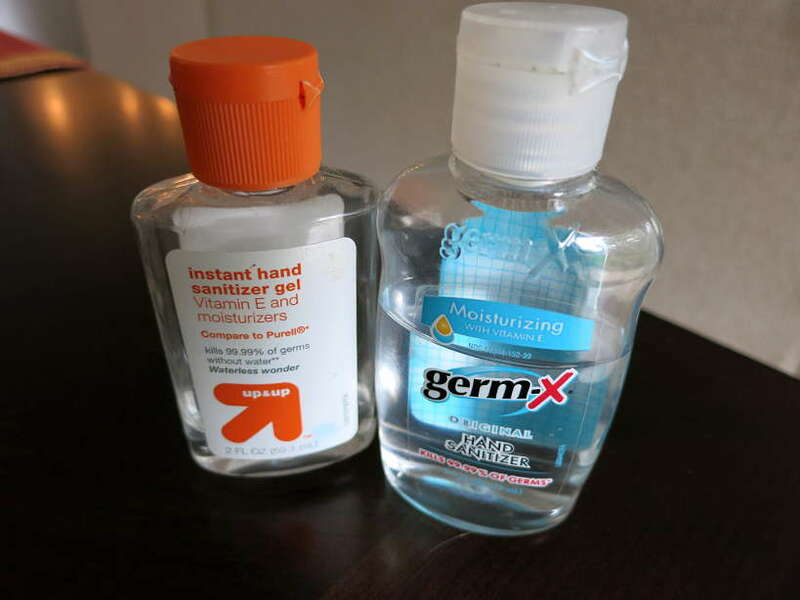 As you mentioned, the best is to play it safe and liberally use hand sanitizer. Thanks Joanna for your comments. Street food sometimes worries me about safety, you’re right. I do agree that farmers markets but I hadn’t thought that choosing a hot dish would be safer, thank you for the tips! You are so welcome for the tips!! Enjoying the local culture through food is a wonderful experience. And, experiencing it safely makes all the difference in the world. Glad you picked up a few new tips for your next trip. Thanks for your comments. I love eating street food – it’s one of my favourite parts of traveling. Especially in Southeast Asia – it’s so delicious and I miss it when I’m not there! These tips are great and I follow them when eating on the street – I’ve only been sick twice in 7 years of travel (In Delhi, India and Lima, Peru) but other than that I’ve eaten street found countless times and been fine! Awesome to hear Kelly, that after 7 years of travel you’ve only gotten sick twice. 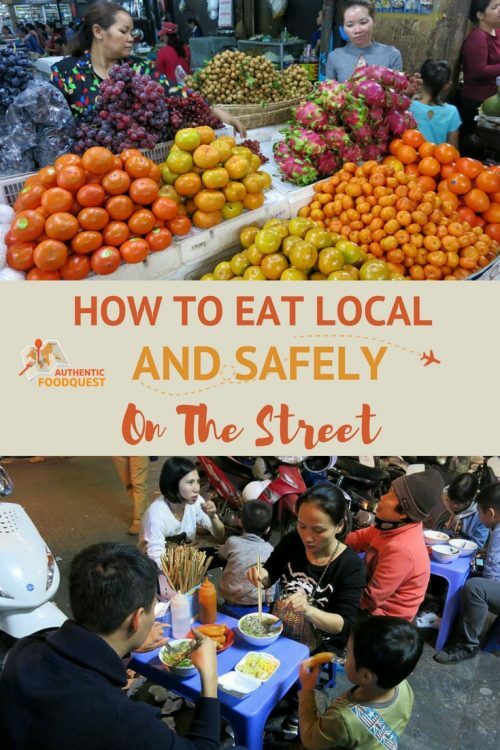 Agree, it is possible to enjoy eating local safely, and hope more travelers will apply these tips and create amazingly delicious experiences!! Thanks for stopping by! These are awesome tips! I get motion sick sometimes and I swear by ginger when I travel. I’ll definitely be bringing activated charcoal with me next time. Thanks for this list. That’s wonderful Emily that you found the tips helpful Do get activated charcoal and watch the difference it will make on your next trip. Glad you enjoyed the article. Cheers. What an extensive guide to eating street food! Great tips, thank you so much. I love eating street food when visiting new cities, so this information is very helpful. That’s wonderful to hear Kim. Are there any particular tips that stood out for you? This is all such great advice!! I love venturing out to try street food but can sometimes be skeptical. I always snack on ginger (usually juiced) and especially when traveling but I wouldn’t think of vaccines to be preventative! Such a good (and almost like ‘duh, why didn’t I think of that) tip! Great post! I love eating street food, but now that I travel with my kids, I have to be a lot more careful about what street food we eat. Buying bottled water helps, and also, your tip about getting travel insurance is spot on. That was helpful for us when my husband came down with amoebas in the Philippines. Thanks Astrid, and sorry to hear your husband had a tough time in the Philippines. Hold onto these tips for your next post. What we like about the GRAYL water bottles, is that we don’t have to buy bottles of water, thus doing good for the environment. In any case, food, water and rest are important to ensuring safe and healthy travels. These are all fantastic tips and I use a lot of these but now I need to start using activated charcoal, what a great idea! Thanks for sharing these tips. You are most welcome. Happy to share the tips. Adding Activated Charcoal will complete your packing kit!! Safe travels, Noel. Very good tips. I follow most of these while traveling or whenever eat street food in my city. Carrying activated charcoal tablets is a very good one. Will pack this in my essentials travel pouch. Awesome to hear you already follow most of these tips. Do get the activated charcoal tablets…so worth the peace of mind!! Such amazing advise on this post!! I completely agree that street food can be safe, but its always good to take preautions like the ones that you mentioned like peeling the fruit and not eating the samples that have been left outside. That being said, I am originally from Bolivia and have gotten sick multiple times from street food so like you said, always check and look around the kitchen area. The beauty of street food is having the “kitchen” right in front of you. Take the time to carefully inspect it and then decide if it looks good and safe. Appreciate your feedback, Claudia. These are such great ideas. I knew about ginger but never knew about activated charcoal! Tummy troubles are a surefire way to ruin a trip. All of these tips are great, I’m a huge fan of ginger myself. That’s wonderful to hear Brianna, that you are a ginger fan. So tasty and so good for you. Anything to ensure food safety while traveling! Brilliant post! I live by all these rules. I even noted the money/food thing not mixing, although early during my travels I was not as aware of this truth. Getting sick as heck a few times made me more observant. See how folks prepare food and present food. Example; we always drink from the chilled water cups with straws at our Buddhist veggie haunt in Chiang Mai, just like your image up top. We also enjoy shakes at stands where vendors clean out the blender after every shake. Some do not, which leads to some serious bloating and belching due to those 3rd world little nasties growing in hot, humid climes, in the blender. You are right Ryan, we need to be super vigilant when it comes to eating on the street. Blenders indeed can carry so many germs. Keeping a watchful eye, fro the food, to the water and drinks makes all the difference. Always welcome your feedback Thanks again! All of these great street food photos and tips have my mouth watering. I love the advice you’ve shared on how to keep healthy while travelling on the road. The tip about eating at spots where kids and elderly do too is particularly useful! I’ll keep these tips handy for our journeys in Asia. Great tip Elisa and eating cooked street food is key to staying healthy. Agree with missing salads. We end up eating a lot more fruits and make tomato and cucumber salads instead. Sometimes, we also buy fresh salad and make sure to wash it well where we are staying. Most often though is tomato and cucumber salads. Give that a shot on your next trip!! That is among the most useful things I have read lately. I am always afraid to eat street food especially in Asian countries but your advice makes me more comfortable now. I had no idea about the Activated Charcoal. I will buy some from Amazon. Great tips! Foods that are part of daily living to certain culture, region, tradition, and religion are referred to authentic food. There is a website that connects authentic cuisines throughout the world. You can taste the authentic cuisines from people who practice it in their day to day life. We don’t drink local water only bottled water. We bring our own plastic eating utensils and napkins. Never eat spicy food or food that smells questionable. These are some great tips – it is nice to try such food but you need to make sure you do it in a safe way, which doesn’t leave you open to sickness. Indeed, you want to taste local and stay safe. Glad you like the tips! I love eating street food whenever I can while traveling. These tips are spot on. I had an incredibly difficult time convincing a friend I was traveling with in Morocco not to order salads and uncooked vegetables. As tempting as they are, a quick way to get sick. Oh wow, your friend was brave. Did she get sick? I truly hope not. Feel free to share this article with her for her future travels. Thanks, Kita. Foods are the best way to get familiar with a new culture. I love this resource for exploring and enriching through food. Thank you so much. So glad you enjoyed the article. I’m usually apprehensive about eating street food. These tips will help ease my apprehension the next time I travel. That’s great to hear Brianne. The key is to apply these tips and you’ll have an enjoyable local food adventure. Cheers. This literally never would have occurred to me because they are so strict with the food trucks here in the US that people rarely get sick. You want to eat street food safely wherever you are in the world. It doesn’t take much to get sick and applying these tips, even in the U.S. will keep you safe. Thanks, Robin. We have traveled all over the worlds, Asia, Europe, South American and North America. I will say, the only place we have been sick from street food is the USA LOL! Asia street food is SOO delicious !! some of the best food I have ever eaten. There is no way of knowing where you’ll get sick from eating street food. The key is to apply these tips and eat safely. Yes, the street food in Asia is to die for. Yum!! These are great tips for eating locally in new areas. It is often hard to know where to eat and what is safe. Thanks for sharing. So glad you enjoyed the article, Gwendolyn. This is so important to keep in mind. I do love to eat local and off the streets, but I also don’t want to get sick. But I love trying new foods! Thanks, Amber, we certainly want travelers to know that they can eat street food safely. Thanks for stopping by. Love your tips! I love eating local when traveling. I don’t travel without my activated choral. It’s a must-have especially for when embarking on new adventures. You are absolutely correct, we don’t leave home without Activated Charcoal either 🙂 Cheers. Wow, that’s a lot to go through to stay safe. I’m not sure I would remember it all. I like the idea of trying authentic foods from street vendors, but making sure it is all ok to eat is important. 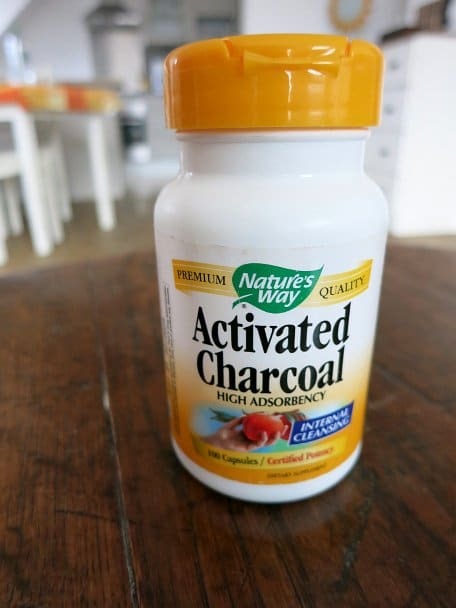 I never thought to take charcoal pills before trying new foods. That is such a good preventative measure. You are most welcome Emily. Glad that you enjoyed discovering activated charcoal. It’s a great product to keep at home or for your travels. Check it out. Cheers. This setting reminds me of my motherland, Philippines. It’s definitely one of the many things I miss. Street food is usually the BEST!! These are all great tips on finding it and eating it safely!! Great point Mary, there is no reason to believe that street food in the U.S. is safer than street food in other countries. What’s most important is apply these tips and being on the lookout for safe and clean trucks/vendors. 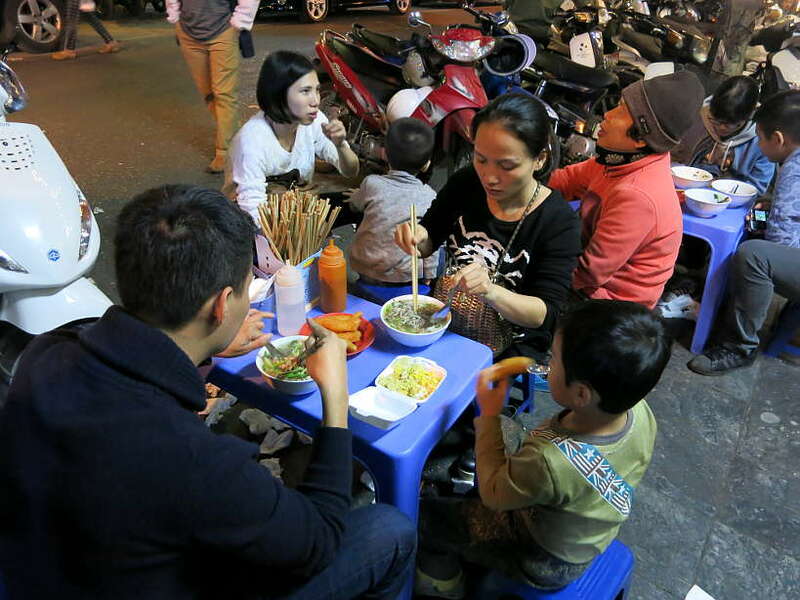 Don’t hesitate to eat on the street on your next trip. Cheers. Love local food! Everything you showed looks sooo good! Is it strange that I’ve never eaten from a food truck before? I’ve been terrified to do so since my dad got sick one day from eating a hot dog from stand. I think these tips will come in handy for a friend who is traveling to NY this week. She said she’d like to try their famous hot dog trucks. Oh wow, don’t let your dad’s experience stop you from eating street food ever. It was just an unfortunate situation. Give it a go and feel free to share the article with your NY bound friend. Thanks, Fatima. We absolutely love street food and will seek it out usually rather than eat on our hotel. Most of the time the food is tastier and less likely to get you sick. Plus its cheaper and you’re supporting someone local. You give great suggestions to keep yourself safe, especially watching out for children and the elderly. We tent to try and eat places that are packed with locals. Awesome to hear Suzy, indeed supporting the local vendors and economy is another reason to eat local. Do you have any favorite street food dishes or countries? I usually go for street food too when on vacation and always stick to these rules. I also stare for a while to see if these vendors are scratching there body parts. Because that is also very un hygienic. Good point about scratching body parts while cooking. The beauty about street food is that the kitchen is right in front of you and you can see clearly what the cook is doing. Thanks for stopping by. Could not have read this at a better time as we have just booked a trip to South East Asia and it will be the first time ever for us to try street food! These tips are amazing – I’d no idea about activated charcoal and I LOVE ginger (I even drink ginger tea daily) so this is reassuring to know! Great advice, I’ve bookmarked this for our trip next year! Awesome to hear Lauren. So glad the article has come in handy at the right time. Yes, apply these tips and you’ll have a delicious time in Southeast Asia. What countries are you visiting? Now I might think twice before eating! So glad you enjoyed the article, Mayuri. Out of curiosity, why are you more cautious now as an adult? If you apply these tips, you are good to go no matter your age. Great topic! This is so important and I know something that many travellers worry about. But at the same time street food is so delicious!! Thanks Hayley, and that’s exactly why we wrote the article. We want to reassure travelers that they can enjoy street/local food and have a richer and deeper travel experience. Thanks for stopping by. Thanks for bringing this to my attention! I wouldn’t have even thought about checking conditions like these when eating street food. Your advice can apply to traveling to any country! Thanks! Thanks, Kylee, indeed, these tips do apply to any country. Thanks for stopping by. Great guide! I always try to grab some street food anywhere I go for the full experience. Being from New York (aka land of hot dog stands and halal carts), if it’s cheap and easy, it’s for me. Luckily, most places I’ve visited have had better street food options. This is such a great guide to eating local food safely! I honestly wouldn’t have thought of half of these so I am really glad I read this. Can’t wait to use these tips to eat all the yummy street food in the future! You are most welcome, Shelby. So glad you enjoyed the article and now have a great guide for your next street/local food adventure. Thanks for such a nice and helpful post..it’s always tempting to try out local street food..but always there is a worry from trying it. Glad to hear you feel reassured by this article. Street food is such a delicious experience and a rich part of the travel. Thanks, Madhu. Thanks for this blog post. We often are worried about eating street food. Your tips are great guides. I would never have thought to look for places where children and older people are eating. Also a good tip to look for a separation between the money people and the cooks! I will definitely be looking to buy activated charcoal before our next trip to SE Asia. 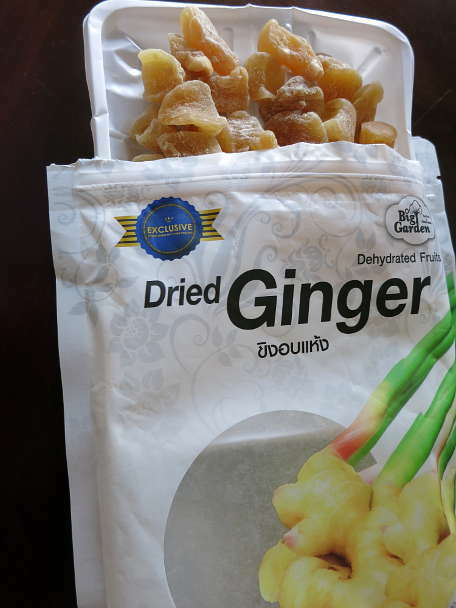 We are big believers in ginger and ate it copiously when we visited Asia this year. Thanks for some new info. You are most welcome, Linda. Happy you picked up new tips and resources like activated charcoal before your next SE Asia trip. Looking for children and the elderly is our biggest tip when selecting where to eat local. 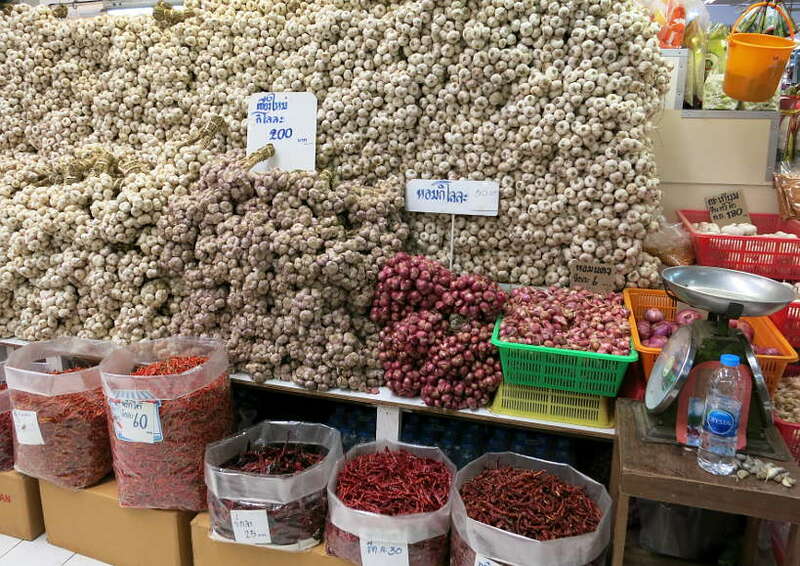 Love ginger and it’s great to eat it all around in Southeast Asia. Safe travels on your next travels and eat local, and safely. Cheers. 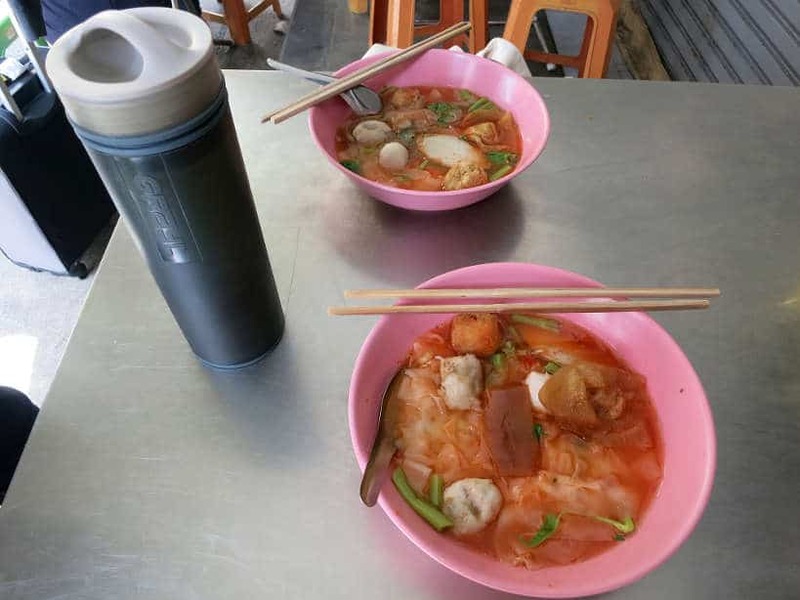 I have always been a bit wary of eating street food and (I havent been to thailand) yet but I head a lot of people eating street food here and have come away with different views. Some says it safe, some not. But I am still willing to give this a try. Havent really done street food before..dont get much of it in London. Don’t fear street food, Danik. The best advice is to follow these tips to ensure a delicious time. Hope your travels take you to Thailand soon 🙂 Cheers. I really believe in the “healing” property of charcoals. My officemate back in college wanted to suicide by taking expired pain dozens of pills. I found her almost unconscious and brought her to the hospital. The nurse quickly gave her a charcoal-based liquid to drink which taste so bad she said she don’t want to do it anymore more. I never thought there’s actually a version of this for food poison matters! Wow, so sad to hear about your officemate in college. That is truly the power of activated charcoal. Yes, there is a version you can use and it does come in handy when you’ve eaten something questionable. Thanks for sharing that story. I have two great takeaways from this post that I didn’t know about before: activated charcoal and filtering water bottles! Thank you so much! What fantastic tips – I was really happy to hear about activated charcoal, and have ordered some as it’s always nice to have that safety net. Such a great tip about the food handling / money handling – we learnt about this at a café I worked in, so always had to take turns at the till so as to not cross contaminate! Perfect, Hannah. So glad you enjoyed the article and the tips. You’ll not regret having the Activated Charcoal with you. It will provide the peace of mind you need on your travels. Separating the money from the food is critical to avoid contamination. Unfortunately, it is not always practiced. Thanks for stopping by. Great advice, thanks so much! I tend to avoid dairy and milk products when possible when traveling. So glad you enjoyed the article. Don’t let fear stop you from enjoying tasty local and street food. Apply these tips and you’ll have a delicious time. Thanks for stopping by. I love eating street food, it is just sooooo tasty! Ironically I think the only times I got sick travelling was at a ‘proper’ restaurant and after buying some packet ham, so eating fresh street food is way better in my experience! I hadn’t heard of activated charcoal before, I need to get me some of that! That’s really interesting Claire. There is no “safe” space for food – be it on the street or in a “proper” restaurant. If you apply these tips, you’ll likely enjoy your food safely no matter where you choose to eat. Having activated charcoal, though is great for peace of mind 🙂 Cheers. Completely understand your hesitation Lisa about street food. As long as you are weary of your surroundings and you apply these tips, you’ll be good to go 🙂 Activated charcoal and ginger are two great preventative items to have with you. Cheers. I’m a sucker for street food! Great tip about going when the market is busy. That way you know that the food is going to be fresh. My husband got hit with amoebas one time after eating street food at the end of the day (as the vendor was closing down for the day). I used to eat street food literally everywhere on the planet. It is cheap, tasty and fun. Even I rarely got illness due to these food where my family and friends used to complain of diarrhea, stomach problems etc. But too much of intake of such foods can result in illness a bit later in life. Anyways I appreciate you finding the time and energy to put this content together.